For decades, labor economists have sought to quantify and predict the the impact of computer technology on both current and future employment, a subject that a new Pew Research Center report probed with a survey of nearly 1,900 experts. Computers had typically been thought of as best suited for jobs that involve routine, repetitive tasks that can easily be reduced to lines of code. But with computer-controlled devices and systems already capable of doing far more than projected even a few years ago, many experts now see more complex jobs coming into play. A look at the highest- and lowest-ranking nonfarm occupations by RTI seems to bear that out. Of the 15 occupations with the highest RTI scores, only one (cashiers) accounted for a higher share of U.S. employment in 2005 than it did in 1980, while 10 of the 15 lowest-RTI occupations grew as a share of total employment over that timespan. But as computing devices have become both more powerful and ever-more woven into the fabric of our lives, they’ve steadily moved into tasks that only a few years ago would have been thought safely in the “humans only” zone. In 2004, for instance, Frank Levy and Richard Murnane wrote that “executing a left turn across oncoming traffic involves so many factors that it is hard to imagine discovering the set of rules that can replicate [a] driver’s behavior.” Today, Google is rapidly making self-driving cars a reality. Last year, two Oxford researchers proposed a new way of estimating how vulnerable different occupations are to future technological advances. The researchers, Carl Benedikt Frey and Michael Osborne, focused on the extent to which occupations involve three types of tasks — perception and manipulation, creative intelligence and social intelligence — that, they argue, are least likely to be fully and successfully automated within the next few decades. The more a job involves such tasks, the less susceptible it is to computerization. 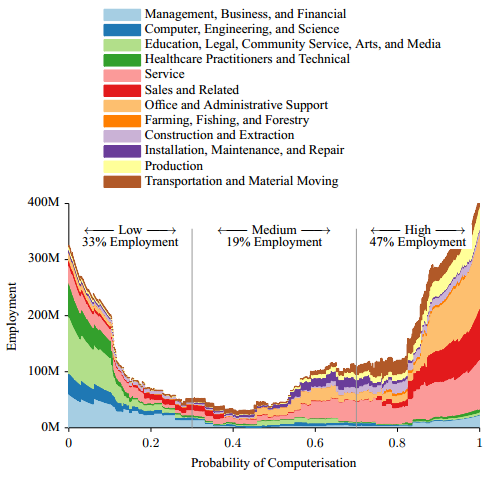 Frey and Osborne analyzed 702 occupations this way, sorting them into high, medium and low risk of computerization. They concluded that 47% of total U.S. employment is in the high risk category, including most workers in transportation and logistics occupations, office and administrative support occupations, and production workers. Among the jobs at the highest risk for computerization: telemarketers, title examiners, insurance underwriters, watch repairers and tax preparers.